Nuclear astrophysics is the study of how all naturally occurring elements formed and evolved into our present universe via nuclear processes, beginning with the big bang and continuing today in astrophysical objects such as stars, x-ray bursters, and supernovae. Emerging from traditional studies in astrophysics and particle research, this cross-disciplinary field touches upon astronomy, astrophysics, cosmology, and particle physics. 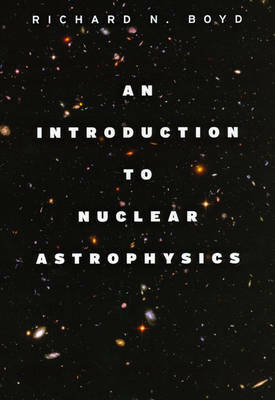 In "An Introduction to Nuclear Astrophysics", author Richard N. Boyd includes basic nomenclature and information so that students from astronomy or physics can quickly orient themselves in the material. Subsequent chapters describe earthbound and space-borne instruments operating in service to nuclear astrophysics worldwide; background topics such as nuclear and neutrino physics, scattering formalism, and thermonuclear reaction rates; and information on galactic chemical evolution, solar nucleosynthesis, s- and r-processes, and gamma-ray bursts. Each chapter includes problem sets so that students can test their knowledge before moving ahead, and the author has included copious references intended to guide students to further study. "An Introduction to Nuclear Astrophysics" is an essential textbook for undergraduate and graduate students in astronomy and astrophysics. It is also an invaluable overview of the subject for researchers in nuclear astrophysics and related fields.